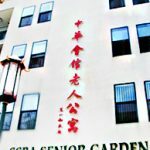 In 1999 the CCBA completed the adjacent Senior Garden Apartments, a 45 unit low-rent housing project with a central courtyard, and a large community room in this four story complex for qualifying low income senior citizens, regardless of race. Optimally situated, bus transportation, food, entertainment, and shopping are within close vicinity. The Community Room of the Senior Garden has become the site for many CCBA activities, such as luncheons, membership meetings, reunions, traditional Chinese celebrations, Chinese movies, cultural performances, classes and lectures. ©2017 Chinese Consolidated Benevolent Association of San Diego.